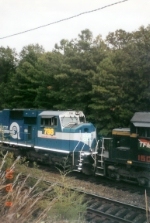 Description: A TFM locomotive was trailing the Conrail SD70Mac, but the picture didn't turn out! Description: A pair of SD70MAC's this time, instead of the usual GE's. Title: NS 11R With CSX 786 in lead! Description: Train is southbound below town at MP 260. Description: This is the first N214 today. This is an empty northbound. Description: Eastbound train at MX Cabin at the west end of the yard at Hinton, West Virginia.